Guess what, y’all. That paper I was working on so hard for class turned out awesome. In the tradition of early Christian martyrdom, “virginity could be the equal of any martyr’s death, signalling one of the most persistent themes in female spirituality” (Rubin, 156). All a woman had to do to be considered a martyr was 1- be Christian, 2- be a virgin, and 3- die. Snow white became a martyr when the Brothers Grimm turned her into one. They took fragments of secular and pagan stories passed down through the oral tradition, fused them together with additions of their own invention, and created a seamless narrative of a virgin’s persecution, temptation, death, and resurrection. The story remains so embedded in our cultural consciousness that even two hundred years later we continue to reinvent and reclaim Snow White, taking a passive Christian martyr and re-appropriating her into a secular hero martyr. From the Grimms to Disney to contemporary filmmakers, the way we choose to tell the story of “Snow White” becomes a reflection of our own cultural narrative. The Brothers Grimm did not, of course, invent the story of Snow White nor any of the others in their collection of fairy tales, the Kinder- und Hausmärchen (KHM) or Children’s and Household Tales. Born in 1785 and 1786 respectively, Jacob and Wilhelm were born in the Hesse region of Germany and grew up to study philology, linguistics, law, and folklore. This was a critical time in Germany, which underwent political upheaval in the early nineteenth century with the overthrow of Napoleon’s forces and the struggle for democracy and identity as a new nation-state. This was also the era of the great German thinkers such as Goethe, Schiller, Kant, and Hegel, “that great and formative age for the development of modern German thought, culture, and education: the last four decades of the eighteenth century and the first decade of the nineteenth” (Smith, 126-7). Romanticism was “a middle-class, pan-European reaction against the ideas of the Enlightenment” (Paradiž, 19) which emphasized a revitalization of the spirit of the past, native language and history, and an idealization of the simple Volk (folk). “Native folklore was to be the ‘healing power’ for the nation, a remedy for spiritual recovery and creative strength” (Kamenetsky, 25). This idealism of the past and the purity of the Volk were a crucial aspect of the Grimms’ personal motivation for the decades of work that went into the KHM. “Broadly speaking, the Grimms sought to preserve all kinds of ancient relics as if they were sacred and precious gems that originated naturally from the soil. In their minds, the tales, myths, songs, fables, legends, epics, riddles, and other narratives that emanated from the voices of the common people contained deeper meanings than so-called educated people realized” (Zipes, xix). The Grimms saw their work as not just a cultural but a spiritual duty. The majority of Germans belonged to either the Protestant or Reformed Church, and the culture was steeped in the ideals of Martin Luther. In his book The Owl, the Raven & the Dove: The Religious Meaning of the Grimms’ Magic Fairy Tales, Ronald G. Murphy examines the personal spirituality of the Grimms in great detail. The irony here is that the Grimms never actually worked with the Volk in the process of collecting these tales, so any representative voice of the poor is absent in their work. The poor are supposed to be the ones gleaning the forgotten wheat, but the brothers took that responsibility upon themselves, middle-class and educated young men, trying represent the interests of a population to which they did not belong and which they did not include. Even more popular than the myth of the Grimms as the original authors of the tales “is the long-standing myth of the brothers’ travels through the countryside, village to village, transcribing stories told to them by farmers and peasants,” writes Valerie Paradiž. The Grimms started by writing down the stories they remembered from their own childhoods, then proceeded to collect stories from their family and friends, mainly the ladies of the Wild and Hassenpflug families. Storytelling was not only a common pastime for these women, but a crucial tool for exploring their place in the world. Folktales told of rites of passage, showed the types of villains one might encounter, and warned what would happen to those who transgress against the rules. “Indeed, many of the Grimms’ fairy tales dole out pedantic lessons in feminine virtue and appropriateness. The means of enforcement are often astonishingly violent” (Paradiž, 53). The story of “Snow White” in particular “silently points to the conditions of women’s socialization, to the cultural context which frames that very process of development, defining and legitimizing it, while simultaneously setting stifling boundaries for it … The Grimm version … is grounded in the nineteenth-century European dominant discourse about women and the bourgeois cult of domesticity” (Bacchilega, 3). Understandably, many modern scholars have interpreted the Grimms’ fairy tales as anti-feminist, but this is a simplistic view that does not take into account the women who were the major proliferators of oral folktales. They used storytelling as a covert instruction manual for behavior in order to survive in patriarchal nineteenth-century Europe. The contributions of these women, unfortunately, went unsung. “When volume one of the Children’s and Household Fairy Taleswas published in 1812, Jacob and Wilhelm didn’t credit their female sources by name. Instead, they celebrated, in the foreword to the anthology, the nameless, poetic soul of German culture and its legions of ‘simple folk’ who had passed the tales down through the ages” (Paradiž, xiv). In sum, women contributed to the process but received no credit, while the poor Volk received credit but made no contribution. After collection, the Grimms proceeded to stamp the tales with their own voices, especially Wilhelm, who was chiefly responsible for the editing process. The stories in the KHM underwent vast changes, both from source to manuscript and from the first edition (1812) to the seventh (1857, now considered the standard). The project was inspired by a collaboration with Clemens Brentano and Achim von Arnim, to which the Grimms contributed only a few folk songs. Zipes concludes that the Grimms could have better defended themselves from critics if they had acknowledged that their stories were actually new tales, continuing the tradition of storytelling through the medium of print. The wide discrepancy between the Grimms’ ideals and their practice can be explained by the fact that their sense of loyalty to their work was based in what they considered the “essence” of the stories, rather than their exact wording (Kamenetsky, 163). The brothers saw their changes as harmless because there was no author of either oral or written stories who could claim ownership of any tale. “The general public did not distinguish between oral narrator and tale writer and regarded published stories as common property free for anyone to change” (Dégh, 69-70), therefore the Grimms would have felt no qualms about altering their material, even those they took from previously printed sources. Faith also played a role in the Grimms’ editing process. “The challenge which Wilhelm faced was how to revive the religious feelings in fragmented ancient pagan stories in such a way that they would elicit a religious reaction of the heart of Christian contemporaries” (Murphy, 7), which he happily did. Wilhelm saw the changes he made as not just harmless but necessary. As previously discussed, strong patriarchal themes were already present in the tales, but the Grimms, whether consciously or not, enhanced them. In Grimms’ Bad Girls and Bold Boys; The Moral and Social Vision of the Tales, Ruth Bottigheimer illustrates how “male protagonists usually got away with devious behavior, such as lying, cheating, and stealing (as did Bruder Lustig), yet the female protagonists were caught in their dishonesty and literally ‘ended up in nail-studded barrels.’ She felt that, with few exceptions, the Grimms’ folktales portrayed women as mute and passive victims dominated by circumstance, a perverted one-sided system of justice, or a powerful male figure (king, prince, or father)” (Kamenetsky, 281). The Grimms also used their own moral outlook in widening the disparity of how good and evil characters are treated in the stories: “the innocent are treated more gently, but the evil or guilty are punished even more brutally” (Ellis, 79). Like all artists, the Grimms stamped their work with their own personal and cultural biases. Despite modern criticisms, many folklorists still praise the Grimms for their innovation and devotion to preserving these relics of the past. In my research, I have come to see the Grimms neither as pure loyalists to tradition nor as unscrupulous frauds but as flawed human men, enthusiastic but oblivious. They are the picture of unexamined privilege: male, white, Christian, middle class, and well educated. It would never have occurred to them to stop and wonder what the implications and long-terms effects of the changes might be. What the Grimms saw as the “essence” of a story may have been completely different than those of the women who supplied the it or the poor Volk whom the Grimms claimed to represent. Nothing is known of how they might have objected to the brothers’ appropriations. For better or worse, the changes were made, the stories were published, and the KHM went on to sell second only to the Bible in the Western world. “Snow White” is among the stories in the KHMthat the Grimms changed dramatically from the original sources (Ellis, 74). This is partly because the several variations of the tale that the brothers collected were so disparate that there was no way to select one as “authentic” or “original.” Instead, the Grimms patched together their favorite bits, added some of their own inventions, and ended up with a tidy Christian fable. This theme of rivalry is especially true in the first edition, before the change was made, because it is Snow White’s father, not the prince, who rescues her, thus reinforcing the “competition for the affection of the father/husband” (Ellis, 76). By replacing the mother with a stepmother, the Grimms turned the story of a child’s self-actualization to one of Good vs. Evil: “In masculine psychology the stepmother is a symbol of the unconscious in its destructive role—of its disturbing and devouring character” (von Franz, 120). The story of “Hansel and Gretel” suffered an identical change, indicating that the Grimms were bowing to the social pressures of their time and culture, which held motherhood as sacred (Murphy, 124). Turning the wicked mothers into wicked stepmothers provided an acceptable distance between the heroes and their villains. The story opens with the vivid imagery of three colors: the good queen wishes for a child as red as blood, as white as snow, and as black as ebony. These colors crop up in similar stories of initiation around the world: “Historians of religion and anthropologists tell us that white, red, and black are the colors which accompany initiation, the process of becoming a whole human being, and the child is given the parts of white, red, and black to mark her potential” (Bacchilega, 4). In earlier versions of the story, the Grimms explicitly listed these as physical qualities—lips/cheeks, skin, and eyes/hair. In the seventh edition, these physical traits were not mentioned, the ambiguity indicating that these colors are both literal and metaphorical. They represent the personal qualities that the queen desires in her child: red, warm and loving; white, innocent and faithful; black, humble and connected to the dark earth and mortality (Murphy, 123). The colors become the first indicator that the story has been given a decidedly Christian flavor; Snow White’s true beauty is not in her physical appearance but in her soul. Snow White is driven out by her vain and jealous stepmother, who tells the huntsman to kill the child and bring back her liver and lungs for the queen to eat (Grimm, 197). Because Snow White is so beautiful (and therefore pure of soul), the huntsman cannot bring himself to kill her. This is another Grimm addition to the story, but “the episode of the huntsman is reminiscent of similar themes of the ‘compassionate executioner’” (Girardot, 289) found not only in other fairy tales but the stories of saints and martyrs. Snow White flees into the forest, the traditional setting in fairy tales for the testing grounds where trials are faced (Murphy, 126). The gatekeepers to this realm are the seven dwarves, monk-like in their compassion, industriousness, hermitic celibacy, and morality (Murphy, 128). They take in Snow White if she agrees to keep house for them, and they serve as the voice of reason in repeatedly warning her to beware of her stepmother. In a story that is now no longer a coming-of-age but one of Good vs. Evil, the wicked queen has become Lucifer, who fell from Heaven “because of his infatuation with his own beauty and his refusal to accept that anyone else was ‘the most beautiful in the land’ … Lucifer tempts human beings out of jealousy… and he always tempts with some form of the same temptation to self-infatuation to which he himself succumbed” (Murphy, 126). So too does the stepmother tempt Snow White with beauty and vanity: first with colorful corset stays, then with a beautiful comb, and finally with the iconic poisoned apple, which, like Snow White herself, is beautiful and “white with red cheeks” (Grimm, 201). “In the three ordeals the stepmother sequentially attacks the white (breath), black (hair), and red (apple-blood) elements of Snow White’s nature” (Girardot, 291), the virtues of her soul that set her apart from stepmother who sees her own worth as purely physical. There is also the parallel “of the apple with the fruit of earthly desires in the Biblical garden of paradise which brings death into the world but at the same time makes Adam and Eve aware of their sexuality and godlike power to create new life” (292). Snow White’s temptation is not a mere apple, but all the apple represents—beauty and sexuality (and therefore vanity and lust). Snow White succumbs to temptation in all three trials—not out of perversity or unquenchable female curiosity, like Bluebeard’s wife in another Grimm tale, but out of her naive belief in the goodness of people; the simple peasant woman offering her these gifts could not be evil (Murphy, 127). Because of her innocence and purity of faith, Snow White is not cruelly punished like many fairy tale “bad girls” but merely falls into a sleep-like death that will eventually be lifted. In further evidence of the religious tone of the story, the dwarfs wash Snow White’s body with water and wine, and all work stops for three days while they mourn (Murphy, 128). Here it is helpful to examine the symbolism present in the illustration (medium unknown, but most likely an etching) by Ludwig Emil Grimm, one of the younger brothers of Jacob and Wilhelm, for the 1825 “Little Edition” of the KHM. 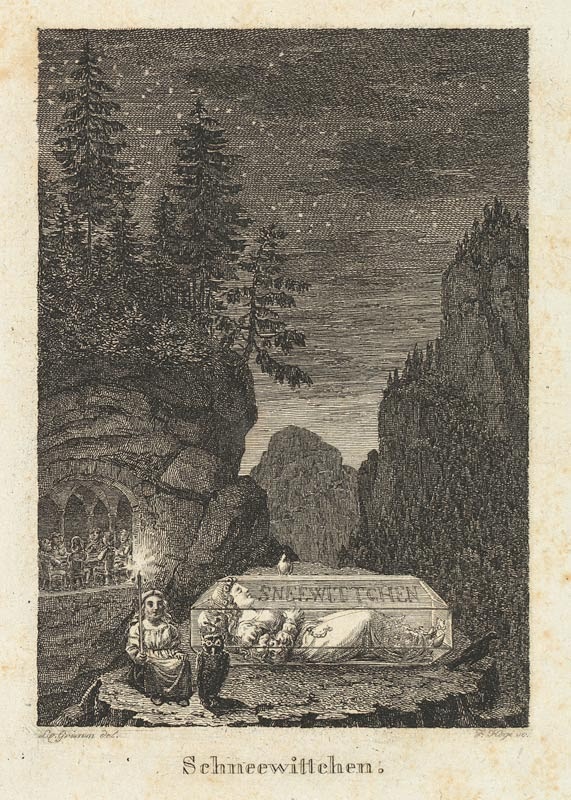 The image shows Snow White in the glass coffin that the dwarfs have fashioned for her, placed on top of a mountain, and guarded by one of the dwarfs and three birds: an owl, a raven, and a dove. Upon her death, Snow White is only seven years old (another detail added by the Grimms). When she begins to display the troubling tendency of giving in to temptation, she is put safely away until the danger is over. “The implication is that as Snow White lay deathlike in the crystal coffin for a ‘long, long time,’ she was of marriageable age at the end of the story—that is, she was around fourteen years old, or seven years beyond the age of seven” (Girardot, 283). If glass is a symbol of virginity (Faur, 27 Oct 2014), Snow White’s identity as a virgin is imposed upon her in the form of the glass coffin. She is trapped—literally by the glass coffin and figuratively by her identity as a virgin—until the dangerous time of adolescence has passed. In example after example of Christian female martyrs, their “purity” is lauded as their most important virtue: Saint Lucy, Saint Agnes, Saint Agatha, the Virgin of Antioch (no name needed, apparently; her virginity is her identity), Saint Apollonia, Saint Margaret, and Saint Christina. It is a disturbing trend that the purity of these women’s faith is conflated with the purity of their bodies: “that the blessed virgin Lucy possessed the beauty of virginity without trace of corruption; that she radiated charity without any impure love; her progress toward God was straight and without deviation” (de Voragine, 27). So too is Snow White pure in body and soul, remaining true to the colors that define her: red/loving, white/innocent, and black/humble. In death, Snow White’s body remains whole, pure and beautiful, suffering from no decay, which is consistent with other female Christian martyrs: “By the early modern period, incorruptibility of the whole cadaver or of a part (that is, remaining lifelike, supple, and without decay for decades after burial) was reported for almost every woman proposed for canonization” (Bynum, 70). Because Snow White is a virgin and pure of heart, her body remains whole in order to be ready for resurrection. The dwarfs take turns watching over the body of Snow White, but she is also guarded by three surprising figures: an owl, a raven, and a dove. The symbolism here is threefold. First, it is a repetition of the three colors that represent the virtues of Snow White’s soul: the reddish-brown owl, the black raven, and the white dove. Second, they are a nod to Wilhelm Grimm’s belief in the universal truths found in pre-Christian religions: the owl for Athena and the classic beliefs, the raven for the old Norse-Germanic beliefs, and the dove for Christianity. Third, they are the ever-present Holy Spirit that stay with Snow White until the arrival of the Son and Father (Murphy, 131). The final and perhaps most important addition by the Grimms is Snow White’s rescue and resurrection by the prince. Because Walt Disney’s adaptation of the story is so deeply lodged in our minds, most people are surprised to discover that in the Grimms’ final version Snow White is not awoken by the prince’s kiss. When the prince’s servants carry the coffin away, one stumbles, and the bite of poisoned apple falls from Snow White’s mouth. In Disney’s version, the prince and Snow White have already met and fallen in love. In the Grimms’ version, the prince sees Snow White for the first time when she is dead in her coffin; if the prince is merely a mortal man, the story wanders into the dangerously gruesome realm of implied necrophilia. Wilhelm Grimm wanted to stir the hearts, not chill the blood, of his readers. The Christ-like prince finds Snow White preserved in her virginal state, sees the worthiness of her beauty/soul, and enables her resurrection, telling her that he will take her to “my father’s castle” to “be my wife” (Grimm, 204). According to medieval writers, “a death to sexual reproductive life was inverted into a life in Christ as his special bride, and the late medieval authors likened the choice of a life of virginity to a death and rebirth as Christ’s bride” (Rubin, 156). If the prince were an ordinary man, Snow White would not have retained her purity in marriage. Instead, like a nun, she has become the bride of Christ. Throughout the various editions of the KHM, the manner of the wicked queen’s death in “Snow White” remains the same. At the wedding of Snow White and the prince, the queen is made to put on red-hot iron shoes and “dance until she fell down dead” (Grimm, 204). This “recalls folk practices of destroying a witch through the magic agency of iron. There are also associations of slippers and shoes with the female sexual organs which, as expressive of the egocentric overestimation of the physical dimension of human nature, represent the root of the stepmother’s evil” (Girardot, 297). True to fairy tale style and the Grimms’ polarized views in doling out justice, the villain suffers a grisly death and the heroine claims her Happily Ever After. The fairy tale collection of the Brothers Grimm has remained hugely influential in the Western world for the past two hundred years. Adaptations appear in every conceivable medium, and “their success attests that the popular audience has internalized these formulas” (Dégh, 84-5). These retellings, often branching off into various subgenres and straying far from the “original” versions, have prompted certain critics to mourn the loss of the alleged purity of the Grimms’ collection. In his article “Yours, Mine, or Ours? Perrault, the Brothers Grimm, and the Ownership of Fairy Tales,” Donald Haase tackles the question of the ownership of fairy tales, debunking two popular myths in the process: nationalism and universalism. The Grimms’ tales are not purely German, for their sources can be traced back to French, Norse, and other European roots (385-6). The stories also cannot truly be called universal in nature, since the Grimms unconsciously wove in their own moral outlook. What psychologist Bruno Bettelheim (author of the renowned book The Uses of Enchantment) saw as universal truths were in fact the authoritarian, patriarchal values of Europe at the time of the Grimms—very similar, in fact, to Bettelheim’s own personal values (392). So if the Grimm fairy tales are neither national nor universal, to whom do they belong? “To be blunt: I do. And you do … We claim fairy tales in every individual act of telling and reading” (395). Fairy tales have no pure, original, incorruptible source. They have been undergoing a process of individual appropriation since the words “glass” and “coffin” were first put together. The Grimms’ tales are not holy texts to be preserved from sacrilege. Some scholars have attempted to do so, but this results in a sterile picture devoid of meaning. It is through this process of individual reclamation and appropriation that fairy tales regain their meaning—the meaning we give them. This is exactly what Western culture has done over and over again. The 1937 film adaptation by Walt Disney might almost be more deeply imbedded in modern American psyches than the Grimm version. Countless advertising and merchandising dollars over the past century ensured that Disney’s version not only became but stayed the new dominant narrative, the ultimate authority on Snow White. But Walt Disney was no less a product of his time than the Grimms. He downplayed the Christian symbolism in the story, but it is still present, especially in the final shot when the prince’s castle appears “not on the horizon as one might expect in a Disney film, but high above and ahead of the prince and his bride, radiant in the sky … like a golden city made of sunlight” (Murphy, 4). Disney gave us the sweetness of a happily ever after romance, a narrative produced and consumed en masse in Depression-era cinema. Since then, however, we have not been content with Snow White as the docile and demure damsel in distress. Modern feminism demands more of its heroines, as seen in the influx of Snow White retellings in the past few years. In the ABC series Once Upon a Time (2011-present), this new Snow White is “spunky yet vulnerable” (Tatar), armed with a bow and a complicated backstory. Another example is the 2012 film Snow White and the Huntsman, “reconceived to appeal to an audience partial to high-decibel special effects … Like all fairy-tale adaptations, it also operates like a magnet, picking up relevant bits and pieces of the culture that is recycling the tale” (Tatar). Once again we see a Snow White who is strong and inspiring, who “channels Joan of Arc” (Fricke; Tatar) and leads an army to reclaim her kingdom. A lesser-known version is another film in 2012 called Mirror Mirror, in which Snow White avoids death altogether by seeing through the poisoned-apple trick and outsmarting the wicked queen. In most contemporary adaptations, the powerful fairy tale images remain—the magic mirror, the poisoned apple, the glass coffin, and the resurrection by true love’s kiss. But Snow White is no longer the Grimms’ one-dimensional archetype nor Disney’s vapid and saccharine maiden. We have given her what the Grimms never did: a personality, a purpose, and a weapon. The Brothers Grimm were another link in this endless chain, creating their own adaptation for their own purposes. Their failure, however, was in being oblivious to the larger implications of the choices they made. No fairy tale adaptation exists in a vacuum. Every story or piece of art is part of the greater narrative of how we represent martyrs, women, and other oppressed peoples. The artist has a responsibility to the truth as they see it, but the work will inevitably be colored by their own socio-historical context. We can—and should—continue to re-appropriate fairy tales, using old stories to find new meaning, but we must be conscious of our accountability and intentional in our choices. Every martyrdom narrative has consequences, but when the martyr is fictional, her voice is our voice; we use her story to tell our own. Snow White is still our martyr; she can be a martyr for each one of us. Ages.” Belief in History: Innovative Approaches to European and American Religion. Ed. Thomas Kselman. London: University of Notre Dame Press, 1991. PDF. University of Chicago Press, 1983. Print. Faur, Amjad. The Evergreen State College, Olympia, WA. 27 Oct 2014. Lecture. Journal of American Folklore90.357 (1977): 274-300. JSTOR. Web. 13 Nov. 2014. Jack Zipes. New York: Bantam Books, Inc, 1987. Print. Grimm, Ludwig Emil. Medium unknown. Fairy Tales.” Merveilles & Contes 7.2 (1993): 383-402. JSTOR. Web. 15 Oct. 2014. Meaning. Athens, OH: Ohio University Press, 1992. Print. Magic Fairy Tales. New York: Oxford UP, 2000. Print. Ecclesiastical History Society by Blackwell Publishers, 1993. PDF. in Germany, 1760-1810. Cambridge: James Clarke & Co, 2009. Print. Ryan. Princeton, NJ: Princeton University Press, 1993. PDF. Lang. Indianapolis/Cambridge: Hackett, 2013. Print.